This video recipe for butternut squash cakes is a team effort between me and my friend, Stephanie Stiavetti, from Wasabimon.com. Stephanie eats gluten-free, and since this is one area I have very little experience in, I gladly accepted her invitation to come over and film a GF dish. I'm notoriously reclusive when working, so it was nice to get out for an afternoon of tag-team food blogging. We thought it would be fun to shoot the video together, but then each of us edit and post our own versions. I'm looking forward to seeing Stephanie's, and I hope she enjoys mine! With all due respect to Stephanie's performance with the "meat cleaver mirror" at the beginning of the video, the star of the show are these lovely, and very simple, squash cakes – little more than a shredded butternut squash patty, spiced with curry, and fried up to crispy-edged perfection. Keys to this recipe's gluten-freeness are the two flours we used to bind the mixture. A corn flour, and a flour made from fava and garbanzo beans. They come from Bob's Red Mill Natural Foods, a company that if you eat GF, or know someone who does, you're probably familiar with. I've included this store finder link for Bob's Red Mill, in case you're interested. Whether you're eating gluten-free or not, this is just a really nice, and very easy, winter dish. I hope you give it a try, and I'll be sure to let you know when Stephanie posts her video. Enjoy! 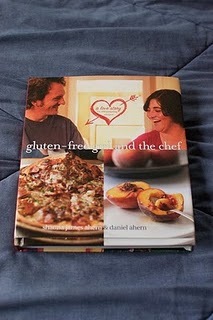 Congratulations to Gluten-Free Girl and the Chef! My friends Shauna and Daniel's cookbook: Gluten-Free Girl and the Chef: A Love Story with 100 Tempting Recipes, has just been chosen as one of the year's best cookbooks by the New York Times! You can get more information about their book in this post, and you're interested in ordering a copy, you can do that on Amazon, Barnes and Noble, and Powell's right now. Enjoy! Love it! I've been a Wasabimon! fan for years. It's my go to site for GF recipes. I'd love to see Stephanie do more videos like this in future. Very cute :) I think I might try this recipe! These look terrific, and I have squash in the house this very second. Many thanks for offering an option for those of us who are poor and do not have a food processor. That was great! Loved the recipe, loved the video, and LOVED Stephanie's hair color! Bought some squash tonight. But alas, no non-gluten flour so I'll just have to do it the gluten way. It'll still be good. Few months ago while searching for a recipe (chocolate lava cake), I came across this site. And, lemme say...pure awesomness. Since then your site is providing puny mortals like me with brag-with-your-stolen-cooking-skills-material! Even though in this country I live and so-called-city, we don't have all the ingredients so we have to improvise, still everything comes out just perfect! Must be some Chef John's curse of awesomness. Oh, that sounds so yummy. I always have a butternut squash around because I love them and get bored with the same old baked thing. Wouldn't this be a good base for creamed turkey or chicken? What a GREAT team. Prime time here you come. Sure enjoy your work. You are a joy to listen to. This was so much fun to watch. You make a great team! And the squash cakes look fantastic. Depends on your portion, but maybe 2 people per pound of brisket. speaking of butternut, whatever happened to the, "Winter Lasagna with Butternut Squash and Broccoli Rabe" you were supposed to make? just wondering. CHEF! i have a food wish: lemon meringue pie. please!! thanks!! This was great! I subbed 3/8 cup almond flour for the bean and corn flours, and it worked very nicely. This will be a new staple in our home!